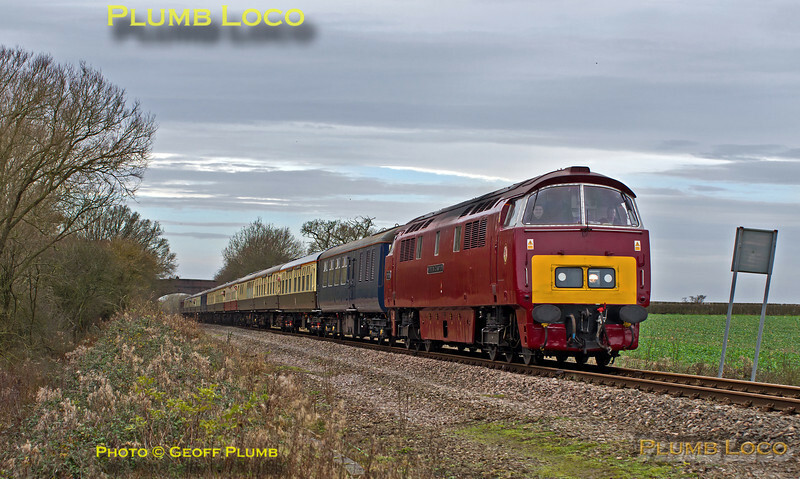 "Western" Class 52 C-C diesel-hydraulic No. D1015 "Western Champion" is hauling 1Z52, "The Maybach Meanderer", 07:01 from Crewe to Quainton Road. Initially 67 hauled from Crewe, the "Wizzo" took over the train at Bescot. It is now approaching the foot-crossing near Charndon, soon to arrive at Claydon L&NE Junction where the loco ran round to head south to Quainton Road. Sadly, the earlier sunshine had given way to overcast skies. 12:36½, Saturday 14th December 2013. Digital Image No. IGMP2177.